Our Friday night crossing over to St. Vaast threatened to be very light on winds and I was worried we’d only get a couple of hours of decent wind as we departed. The forecast for the return leg on Sunday turned out to be the complete opposite. The crew met at the Boathouse Cafe for a bite to eat before our safety and passage briefings. 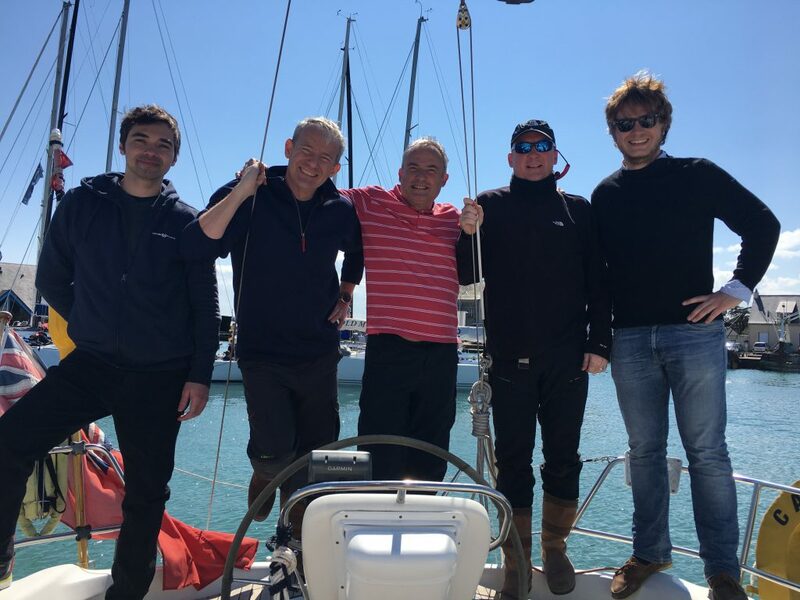 Everyone was excited and raring to go, and even though there was a fair amount of experience between them, only a couple had crossed the Channel before. As soon as we left Portsmouth harbour it was obvious the winds were stronger than forecast and we enjoyed a lovely sail in 12 knots of breeze along the main channel and towards Bembridge. As we rounded the ECM, we set our course for St. Vaast. 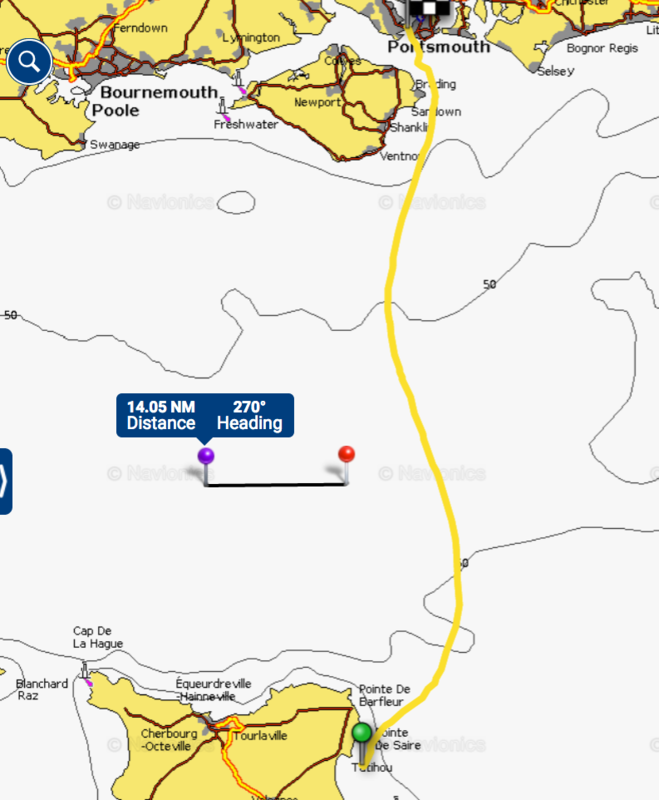 The net tide on this leg was negligible and Jacques, our navigator gave the helm our course of 187. As it turned out we sailed until 0300 before furling in the genoa and motoring. After a couple of hours the wind picked up again and we switched back to sailing. We made it most of the way to our waypoint off Barfleur and then motored the final couple of hours into St. Vaast harbour. We needed to arrive no later than 1500 as the lock closed then but our original ETA of 1130 was looking very achievable. Mooring up wasn’t entirely straight forward as one of the crew wasn’t comfortable jumping onto the low & very bouncy pontoon but help was soon to hand from friendly crew on the neighbouring yacht. 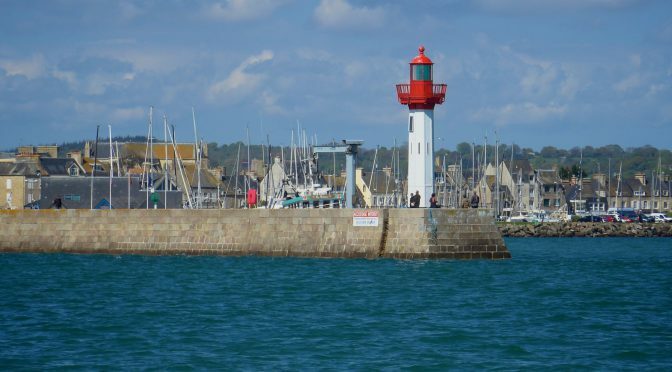 St. Vaast is a lovely destination with a very provincial, non-touristy feel to it. 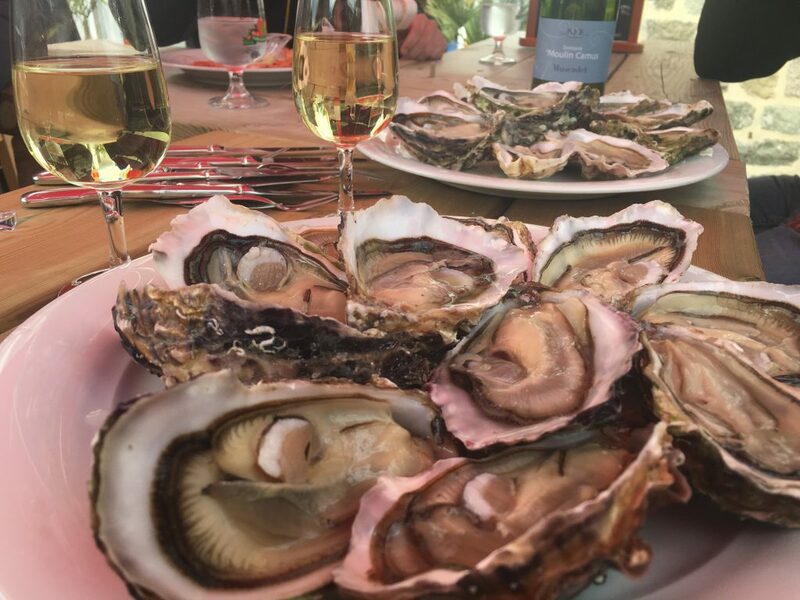 As we were to observe that evening, when the tide was out, huge areas of the shoreline form oyster beds which are harvested and served locally. The best I’ve tasted (since I was last here). The former secretary of the Junior Offshore Group approached us over a beer that afternoon and very kindly invited us to their party that evening. This club was set up in 1950 to offer smaller boats the chance to race offshore, as RORC (at the time) only permitted bigger yachts to compete. We joined them, drank their wine, learnt a lot about how they operate (super informally and entirely Corinthian in approach) and I hatched a plan to persuade Pete that we should enter Windchat later in the year. We planned to leave for home early afternoon Sunday and arrive at a respectable 0700 into Portsmouth but the weather was now forecasting strong winds (F7) sooner than had been forecast on Saturday. So I decided we’d leave soon after the locks opened at 1100. It would mean an early hours arrival but still well short of the predicted wind speed increases. Jim & Jeremy fetched pastries & baguettes from the boulangerie for breakfast with what was left of the ‘oyster kitty’, Nev cooked up a superb chilli and we slipped lines at 1115. I let Solent Coastguard and our shore contact know our ETA was 0200. We started with 2 reefs in and although a little underpowered to start with, as we moved closer to Barfleur it was perfectly balanced. Over the next few hours we enjoyed an energetic sail with 3 reefs, back to 2, then to one and back to 3. The sea state was moderate and it was definitely cold. A few of crew succumbed to seasickness (one of them quite badly) and we settled into our watch system from 1500. At 1538, the DSC alarm sounded with a sécurité alert and I tuned the VHF to listen to a new gale warning just issued. Wight Gale force 8 SW soon, becoming 9 severe gale 9 later. This wasn’t in the plan. We could expect a force 8 by 2300 and a force 9 by 0500. Although the latter was long after arrival it could, of course, come early. Jacques and I rigged the storm jib in readiness. The windex was playing up so it was difficult to judge exactly how the wind might be building – I made sure the crew knew to report any challenges with the helm. It seemed remarkably light winds – the phrase ‘calm before the storm’ came to mind but we were making good speed. Our track on the chart was in line with expectations of the very strong net westerly tide (14 miles due to springs and the much stronger tides at the Cherbourg part of the Channel) but I double checked it was going to swing back and take us back towards Bembridge. You can see a classic s-shaped curve of over the 12 hours here. At around 1800 the wind had backed completely behind us and lightened. We kept the main out with its preventer, furled the genoa and switched on the engines to help. We were now making a good 7.5 knots towards the Isle of Wight. We entered Portsmouth harbour and moored up in Gosport at 0100 after nearly 13 hours which felt like a fast crossing. 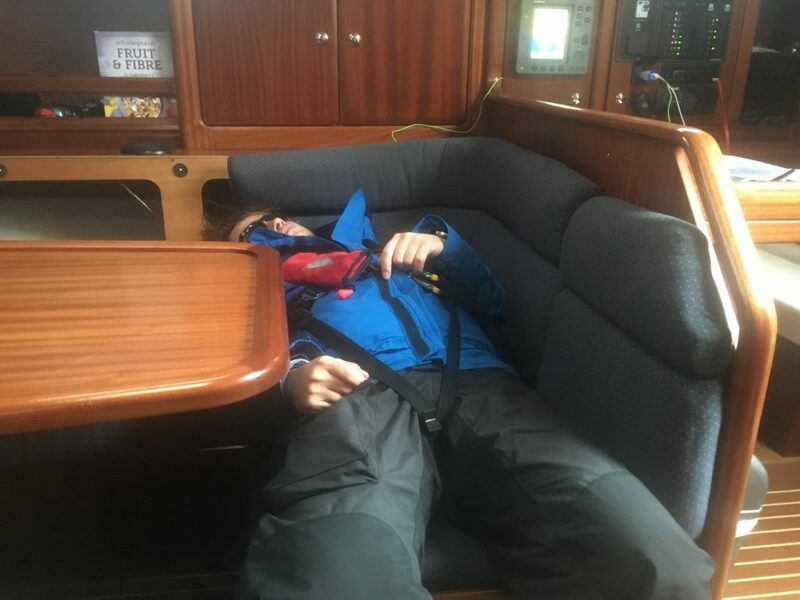 We were all able to enjoy some decent kip before bacon sandwiches in the morning and sorting the boat out. We had our Bank Holiday Monday back which was a bonus. Log entry. 28.4.17 Cartel – Bavaria 40′. Skipper. Gosport-St.Vaast-Gosport. F6. Moderate. 153NM tidal. 10 night hours.